I had to read The Killer Angels with my phone on hand, as I constantly needed to look things up I hadn't thought about since grade school. 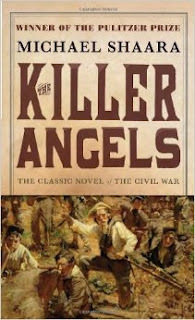 It's historical fiction, an account of the Battle of Gettysburg. So, actual people, factual dates and events, plus lots of dialogue lifted straight from documents written at the time - but much of the characterization and interaction comes from Shaara's imagination. My Civil War history game was pretty weak before this book. Still is. But every night I'd share something I'd re-learned with Terence, and by the end he decided I was ready to film an episode of Drunk History. Not so sure about that, but at least I've been refreshed on Dred Scott. And I have to say that while history is not typically my jam, I was wholly sucked in, even emotionally invested, by the time the battle actually started. Discuss the commentary on the evolving nature of war. What kind of war is "better", if any? How does a sense of exceptionalism fortify Lee for the barbarism of war? How does he see himself as a god-like figure? Consider the politics and morality behind the choice to invade or only fight defensively. How much does Shaara romanticize war in general? How much is the past used to calibrate expectations for the future? Discuss the personal "wars" that run parallel to the actual battle (inner and interpersonal conflicts, etc). What role does divine providence play? What is the significance of Fremont? Why the frivolity and shortsightedness? Comment on the larger relationship between southerners and the English. How prescient is Longstreet's discussion of modern warfare? Compare Lee's faith in god to his faith in the army. Comment on the role of morale, and the momentum of previous battle wins. How much do these factor into Gettysburg's outcome?